Our flagship project working with adults living with dementia and the people around them. Beat It Percussion is developing a new project called A Gentle Beat. 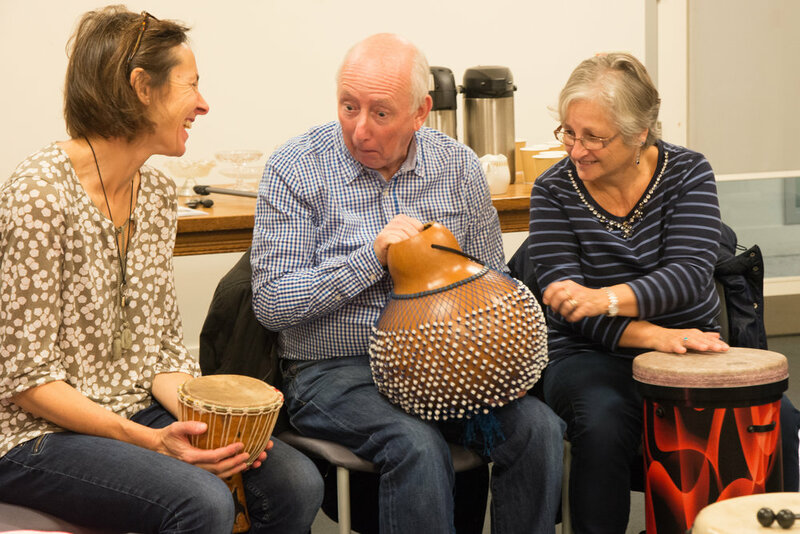 This has grown from our Care and Nursing Home customers’ requests to provide a meaningful creative experience for people who are hard to reach through advanced dementia or nearing the end of life. 2018 sees exciting opportunities for growth and development for Beat It Percussion CIC. Beat It uses rhythm to integrate diverse groups in the community. We have been engaging in research through many of our projects. Working with the University of Gloucester more details of our research wok can be found on the link below. In 2018 Beat It’s CEO and lead practitioner will qualify as a Group Sound Therapy Practitioner with the British Academy of Sound Therapy (BAST). Living with Dementia. Drumming Together. The sense of achievement and purpose gives (residents) confidence. This activity gives people a buzz as they all have a turn and there is anticipation waiting for your turn, a controlled anxiety leading to a sense of achievement. It has been something different, it was nice helping each other and joining in, it has been fun. I was surprised by how well the students followed the rhythm and improved in their ability to follow a beat and listen to instructions. I want to say thank you for giving my husband the chance to participate in this. He has actually enjoyed showing me what he can do. It is a long time since he connected in this way, and I have seen him in his element being entertaining. Thank you for this glimpse of the ‘old’ B. A big barrier in the home in folk coming together is often difficulty in communicating. Folk sometimes may not know what to say to each other, feel uncomfortable, or are unsure how to make a meaningful connection. I have found the sessions very helpful in providing a universal form of communication and one that all those who wish to take part in can do so. We would love to share all of our exciting projects with you. If you would like to be sent our newsletter please enter your details below.